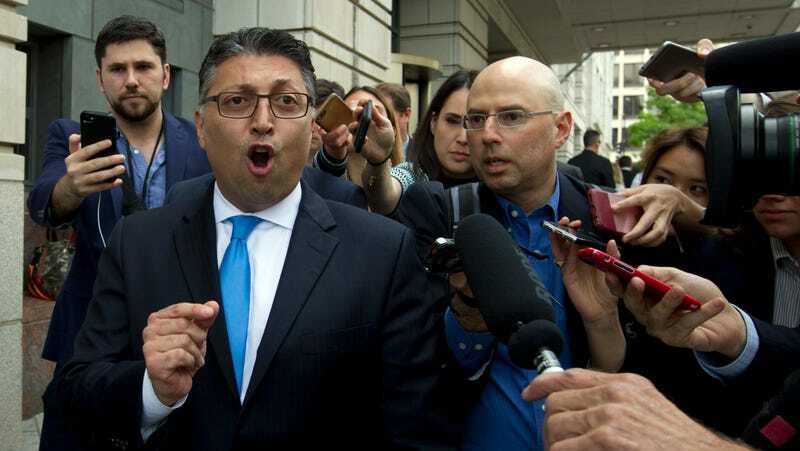 Assistant Attorney General for Antitrust Makan Delrahim outside federal court in DC, June 2018. The Department of Justice has warned the CEO of the Academy of Motion Picture Arts and Sciences, Dawn Hudson, that any attempts to prevent Netflix and other streaming video companies from receiving eligibility to be considered for an Academy Award may earn it antitrust attention, Variety reported on Tuesday. The most vocal voice to exclude Netflix and other streaming services, of course, has been director Steven Spielberg—who last year began ramping up his exhortations that because Netflix is a TV format, all of its film productions are technically TV movies and should be submitted for the Emmy Awards instead. The Oscar eligibility guidelines also state that any film put up for consideration must have first gone through a qualifying theatrical release before it is distributed via another channel. However, Variety reported in early March 2019 that Spielberg was planning on pressing the issue further with Academy members, and Netflix has fired back—that’s not even considering that the numerous other streaming services already in operation or being planned for launch in the near future are going to feel just as strongly about plans to exclude them. Delrahim’s decision to put his thumb on the scale adds yet another odd dimension to what’s going on. Maybe he’s a streamer. In any case, Delrahim has a full plate with other big priorities on it right now, such as the potentially terrible for consumers Sprint/T-Mobile merger, which his office hasn’t issued a decision on yet.